I was at the grocery store this morning with my kids and Jude crawled into the bottom section of the cart, laying flat as if he were Superman. A man passed us and said to me, "he is about to get hurt". I smiled at him and said that I had just said the very same thing to Jude. He walked away, shaking his head at me in judgment. I assume the message was that I was too permissive or not protective enough. We moved on to the checkout line. Ronan said aloud that he wished he could have one of those balloons that were floating at each register. As the woman stopped checking us out and prepared to cut two balloons down, I interrupted her, thanking her for her generosity, but said that the kids behavior in the store did not win them a balloon (I left out the part about the fact that balloons always lead to tears at my house). Of course Ronan protested, but the woman momentarily gave me a look that seemed to say something like: "lighten up lady, don't be so strict." Hmmm. Too strict or too passive? Maybe both in different scenarios. While I don't expect people I meet in the grocery store to applaud me down every aisle for my parental consistency, for following through on my word, for allowing my kids to learn (some of) their own lessons when it won't kill them, for the decisions that I make based on my values and intentions...I wish that we, as a society were not so quick to judge others. Judgements about parenting starts during pregnancy (or even before if you wait too long or start too early!). There are so many decisions to make and they many of them come with a certain degree of anxiety or guilt. Because there is so much anxiety and guilt, these decisions are typically made with plenty of consideration...and the opinions of others. Natural childbirth or epidural? Breast feeding or formula? Circumcision or not? Go back to work or stay at home? These decisions are just during infancy. There are thousands of decisions that follow those, and an endless supply of people to let you know how you are doing. I can stress out about how the world views my parenting (and in my more difficult moments I confess that I do), or I can smile, thank the person for what I know is a good intention and see if I can learn anything from it as I walk away. Frankly I judge myself harshly enough (and so do my children) that I don't find I often need unsolicited outside consulting on most parenting decisions. I am not afraid to ask or read to educate myself when I feel I need help - in fact I am almost always in the middle of a book about some aspect of parenting or teaching. A new friend recently gave me this beautiful idea for a project on finding the good in people. It is a Treasure Hunt involving people and the basic premise of the game is to talk to people you don't know, tell them that you are on a Treasure Hunt looking for the good in people and that you are looking for a compassionate person, a brave person, a thankful person, etc and ask them if they are one of them or know of someone who is. Then you listen while they share the good about themselves. I love how this looks for the good in people, how it emphasizes the importance of character in a non-judgmental way, and gets my family talking and listening to others. They guy who told me about this did it with homeless people and since we feed homeless people several times a month, it seems like a reasonable place to start, but it doesn't have to be the only place to find people with some good in them. It is said that you get what you put out in this world. Perhaps looking for the good in me will allow me (and perhaps others) to see the good in me. Surely it will more good than be judgmental and that is reason enough to do it. For a beautiful character-strengthening message inside a great story, try this book for the 4-8 year old crowd: "Have You Filled a Bucket Today?" The premise of the book is that we all have an invisible bucket and when we do kind things for others (helping others, saying something nice, including people, giving a hug) we fill their buckets and we fill ours at the same time. When we are unkind to people (calling them names, being a bully, hitting) we dip into their bucket and our own. The fuller your bucket is, the happier you are, so the idea is to keep your bucket full through kind deeds as much as possible. The book has one seven awards and is a best seller. 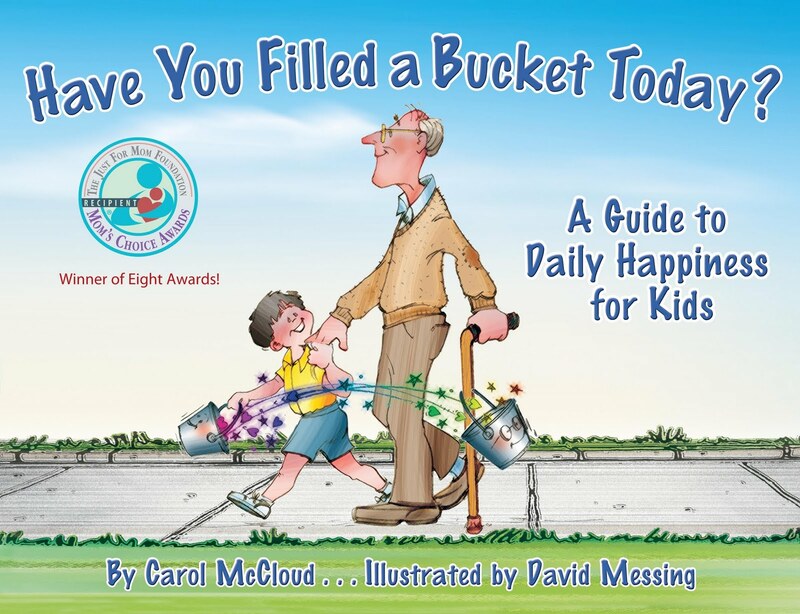 Many school districts in Michigan, where the author, Carol McCloud lives, have adopted not only the book, but Bucket Filling programs in their schools, allowing students to nominate and recognize kindness in others to promote those qualities in their student body. The book really resonates with children. It gives many colorful examples of how to fill and dip into a bucket that kids can relate to. The visual of the bucket helps them to understand how this works and to sort out their own feelings. It is a great way of promoting not only kindness but compassion as well. This is one of my kids' favorite books and each time they do a good deed they comment on how many buckets that deed filled. For example, for our theme of giving this month we have fed the homeless several times and each time we do it, they comment on how we not only fed people today but filled their buckets and ours too. They love that! I got to know the publisher of this book, Nelson Publishing and Marketing when I was trying to publish my own children's story. Although I decided not to publish it for various reasons, I became impressed with Marian Nelson's vision. Unlike most publishers, she will publish books by first time authors, but she will only publish books that somehow further such attributes as peace, tolerance, and understanding. Her mission is to create a greater understanding of humanity through the written word. I've read many of her books and that is exactly what her books do. I really respect that. As I got to know Marian better she asked if I would be interested in selling her books in Colorado. I readily agreed even though I know it is not going to make me a wealthy woman, it is in alignment with promoting the greater good in people. If you are interested in seeing the other book titles that they offer, or in possibly publishing a book of your own, go to www.nelsonpublishingandmarketing.com. 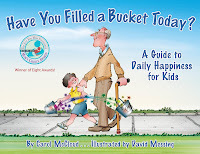 If you want to buy the books you can do so through their website, or if you are local I am happy to get you a copy of "Have You Filled a Bucket Today?" In a recent article I highlighted a few of the differences between two alternative education modalities: Waldorf and Montessori, focusing on classroom materials and fantasy versus reality. In this article I will explore the differences between the two in terms of the classroom structure and teaching. In Montessori, transitions are structured in three year cycles. Students typically stay with a teacher for three years (less time for babies and toddlers) and there is a three year age span grouped together. This cohort works well in many ways. As the children get older, they take pride in showing the younger kids around the classroom and getting them acquainted with the rules and customs. The oldest children get plenty of experience in leadership and nurturing. The younger children seem to really like getting help and instruction from their peers. Being in the classroom with the same teacher for three years is beneficial in that the teacher gets ample time to really get to know the children and to see them grow. Because there are three different age groups in the classroom and because of the nature of most Montessori classrooms with the students' ability to choose their own work, it enables all students to learn at their own pace. Montessori classrooms are set up with "work stations" full of manipulative materials that the students are allowed to choose to use. When it is done in pure Montessori fashion (which is not always the case) it is very student-directed rather than teacher-directed. The teacher acts as a facilitator and supervisor. This is anything but chaotic though. There is a hum to the classroom but the students are engaged in their work. In addition to academics, there is an emphasis on harmony, social graces, personal responsibility, independence, productivity and quiet. Montessori teaches "the whole child" and art and music are components of their day, usually done as "specials" taught by different teachers in different classrooms. Parents with high energy children may initially find this untraditional classroom to be a good fit because students are not forced to sit in a desk all day, but it takes a high degree of personal responsibility and independence to thrive in this kind of classroom and many parents with these energetic children did not think the unstructured Montessori classroom worked well for them. In Waldorf classrooms, the children are all generally the same age starting in first grade and they are with the same teacher for eight years in most cases. The students shift classrooms each year but all stay together. There are many advantages to this structure as well. The Waldorf teacher has the time to form a strong community. The teachers, parents, and students become a family after so long together. It promotes continuity and even more of a deep understanding of each child's growth and abilities. There is often the fear that if there is a poor fit between a teacher and a student, eight years is a long time, but this is relatively rare. Waldorf teachers tend to be very committed (it's a way of life for them, not just a job) and are also highly educated. They generally have plenty of support in their community as well to help students in any way they can. Because they teach more than just academics (the are also artists, musicians, singers, actors, story-tellers, knitters, etc.) there is plenty of ways to reach a child in ways beyond academics. The Waldorf classroom resembles a conventional classroom in that learning is teacher-directed, not student-directed, there are desks (or tables) rather than work stations, and the day is very structured. Just like in conventional settings there are benefits and drawbacks to this arrangement. However, because the children get daily nature walks, art, music, and knitting, among other things (usually done by the main teacher in the same classroom - they are very talented, renaissance people!) there is opportunity for creating and movement that help with classroom management. In the pre-school setting, the classrooms look much more chaotic and are louder than any Montessori I have ever seen, but fantasy and play are being encouraged more than productivity and quiet as in the Montessori classrooms. Our family was very fortunate to have gotten to know both of these modes of education and we appreciated many aspects to both of them. It is interesting to me that they are both alternative education and both have the goal of teaching to the whole child, yet they go about doing that in very different ways. The outcome is typically good for children in both environments. What to Do About All of that Homework! Homework is a hot button topic. Anyone who has ever been a student, is currently a student or who is the parent of a student has an opinion about homework. Today when I Google “homework ” I find 40,100,000 results. Many of these homework sites offer tips to help children with their homework and accept the status quo – that homework has been a part of the American public school tradition since the early 1900s and will remain a big part of our education system for many years to come. But I didn’t always feel this way. I’m trained as a middle and high school teacher of English, history, and reading. During my teacher training, I accepted and believed in the validity of homework. After all, I went through school, did some homework, became a teacher and turned out fine, so homework must have helped me achieve those goals, right? But I didn’t have a lot of homework as a child, and I didn’t mind doing the homework I did have. It wasn’t until I had my own children that I really began to question the value of homework. But, sadly, that didn’t happen until they were in the 6th and 8th grades. Why did it take me so long to really examine their homework and question its importance? But what happens when it doesn’t do those things? What happens when I did everything I was told to do by the school – set up a regular homework routine, gave my children a healthy snack before they start their homework, provide a quiet, well-lit place for them to do their homework – yet they still struggled with it? What happens when we explored more avenues of homework help for one of our boys in particular (multiple tutors, special education resources, psychological testing, medication) and he still struggled with homework? At some point, I finally stopped blaming my child for his homework limitations and started blaming everything else around him. I blamed the school, I blamed the teachers, I blamed the administration, I blamed the system, I blamed myself, I blamed my parenting, I blamed it on his ADHD. But when the blaming didn’t change the fact that he still struggled with homework, and still had hours and hours of it, I finally changed my attitude about it. All this homework turmoil was a blessing in disguise. I found Sara Bennett’s website www.StopHomework.com and that became an excellent daily resource for me and helped me see that there were many more educated people all over the US who disagreed with the idea of homework. I also read her book, “The Case Against Homework,” and got many good ideas from it. I read countless Internet articles and more books on homework. I talked to and emailed people about homework. I learned about Challenge Success, Denise Pope’s program at Stanford. I started learning about many other pro-child programs that shared my views of homework. I enlisted the help of a friend, Julie, who shared my feelings about education and homework. We got a small group of parents together to talk about homework. We found that as soon as we starting discussing homework as a group, the talk quickly morphed into discussions of parenting, education, standardized testing, ADHD, teacher-training, college admissions, curriculum development, student stress, AP classes, childhood obesity, mental health issues, competitive sports, tutors, over-scheduled lives, finding balance, etc. We concluded that there were many problems surrounding homework and no simple solutions, yet we wanted to do something about it. We took an informal email survey about homework from other parents in our district and got 100 responses that we collected in a spreadsheet. We brought that along with many articles and books on homework to a meeting we had with our school district’s curriculum instruction director. A week after that, the district (which serves over 27,000 students) formed a homework task force to rewrite the outdated policy. I was fortunate enough to be on the taskforce as a parent representative. The taskforce had 19 total participants – a combination of parents, teachers and administrators. Even if I didn’t get exactly what I wanted in the homework policy, being on that taskforce was a good experience for me and has led to other projects I’m working on now. See the film “Race to Nowhere.” The experience also helped me formulate more conclusions about homework. One of those is that homework is not the cause of, but rather a symptom of many problems in education. Teachers often give homework because they say they don’t have enough time to complete everything during class time. If we changed the mindset from believing that we need to teach a set amount of information in a limited time, to focusing on individual needs and learning goals of each student, we would approach education differently. Without pressures from above to fulfill state mandates and without pressures from administration to teach to a test, teachers would ideally be free to collectively and creatively decide how students learn best. This is no simple task, however, and it involves a shift in thinking about the principles of education that will then naturally lead to a change in practices of education. The good news is that there are great teachers and schools doing this, successfully every day. Even a big, public school can learn from these smaller schools and teachers that have discovered how kids learn best. Learning is an organic process, not a linear one. We can’t fill up a kid’s head with knowledge, have him do his homework, take some tests, graduate and call it success. We have to figure out what turns kids on to learning and how they learn before we can help them learn. In our new technological age of constant information, we have to shift from memorizing and regurgitating facts in school to making sense of all these readily-available facts by analyzing, synthesizing, creating, innovating and problem-solving. We have to move from teacher as expert, to teacher as facilitator. We need more student choice and voice. We also have to redefine success in this culture. The truth is, I don’t actually mind if my kids have homework, AS LONG AS IT TURNS THEM ON TO LEARNING, and as long as it isn't just a spewing out of facts, and as long as it doesn’t consume their whole evening, weekend or holiday. But what I've observed over the last ten years is that their homework usually does TURN THEM OFF to the subject and it's usually a teacher-created exercise focusing on how well they follow directions rather than on how they synthesize and use information. I've only seen a few really inspired assignments through the years. Sadly, what usually happens is this type of scenario: After doing a time-consuming English project last June, my older son said, “I’m so glad that’s done because now I don’t have to read another book until next year when school starts.” That was a perfect example of a homework assignment that killed the joy of learning (and reading!). I hear comments like this from my kids much more often than I hear comments about how excited they are about what they are learning in school. The things that excite them in school are their friends, the extra-curriculars, and the precious few days without homework. As I sit here typing, my son (who is doing his homework) just said "I hate school. But school wouldn't be that bad if we didn't have homework. Why do we have homework on the weekends?"